While it’s never a bad idea to go the traditional, wood frame route of cabinetry, a lot of people are trying to think outside the box, to do something they’ve never seen anywhere else. It’s always nice to receive admiration on something you decide to do, especially when it’s renovation of your home. Here are few ideas of some trendy ideas that a lot of people are picking up on in the realm of cabinetry design. A trend that’s been around for a while, built-in appliances have been a stand-strong feature for new-age kitchens for quite some time now. Having a stove, microwave, or fridge incorporated into the walls of the kitchen shows you made a conscious decision to cloak the appliance when not in use. 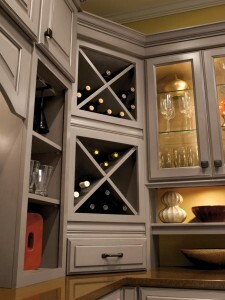 This allows for people in the kitchen to fully appreciate the cabinets for what they are. Wine has always a place in the contemporary kitchen, today more than ever it seems. More and more people are appreciating wines, spending more money on them, and showcasing them in a kitchen, cellar, or den. What better way than a custom wine rack. Wine racks not only look great, they also allow for easy access to your reserve, allowing you to be the best host you can be when throwing events. A bigger kitchen is never a bad thing, and a trend that’s been seen more and more of with these bigger kitchens is leaving the space more open than before. Sure you can furnish a bigger kitchen up to every inch, but you can also restrain and have only your kitchen essentials surrounding you, leaving you with a bigger floor plan. This allows for less clutter, and more open space and peace in your kitchen.